Essay: What defines a video game genre? Genre is something that is already well known and established in other humanistic fields such as literature and film studies. But with games only recently entering the academic scene as a valid area of study, the specifics of what defines a genre is once again opened up for questioning. As consumers, we generally think of a genre as being a combination of the many individual components of the game production pipeline: Art, sound, setting, story, player goals and challenges. They all have an impact on which category the game eventually fits into, and this makes it easy for consumers to pick up something they know they will like. But with recent academics debates raging – narratology versus ludology, and the difference between interactive games and other media – it might not be that simple. This essay sets out to understand what defines a game genre, both from an academic standpoint, and in terms of how they are produced. Do the same rules that apply to film and literature apply to games? Or are games a completely separate entity, when it comes to genre? Game scholars commonly agree, that the best way to describe a game, is through the style of gameplay, since this is exactly what sets games apart from other media. Ernest Adams(2007) claims that the story elements of a game are irrelevant, since changing these, wont actually change the experience of the game itself. An action game, for instance, can be set in the old west, or on an alien planet – it is still an Action game just the same. A very similar theory is presented by Zimmerman and Salen(2006), which states that it is simply the similarities between games which will dictate what a genre is. By looking at early games and analysing them, we can find common traits and patterns of which links them together. When you have a collection of identical patterns, you can then divide these games into categories, and thus individual genres. This is useful for concluding how different games relate to one another, and to create an extensive index of what has been created so far. When new games enter the scene, you simply expand your collection of patterns based on the new findings. In the paper Play Dead, Diane Carr talks of this exact phenomenon. By comparing two very visually similar games, Silent Hill(1999, Konami) and Planescape Torment(1999, Black Isle Studios), she questions how games with the exact same aesthetic traits can end up in wildly different genres. Both games contains zombies, scary corridors, violent confrontation with bizarre monsters and plenty of gore. But somehow one of them is considered physiological horror, and the other a fantasy roleplaying game. Planescape Torment, for instance, features a levelling system and experience points. This is a trait also found in Dungeons and Dragons from 1974 (Which Planescape Torment’s ruleset happens to draw strong inspiration from). Since this game in that case follows the pattern of previous games, it naturally fits into the same genre, despite the overlaying visuals. Silent Hill, on the other hand, does not have a levelling system, dialogue options, or companions, and does therefor not qualify as a roleplaying game. This means that Silent Hill and Planescape Torment should indeed not be judged on it’s monsters or choice of colour scheme, but rather on it’s playing style. In fact, according to Aarseth and Juul, the zombies doesn’t even matter at all. They could have been depicted as 8bit boxes and it would have no impact on the games themselves whatsoever. And this also ties in with some of Carr’s findings, as she determine some of the most important differences between the games: One of the games does not let the player save whenever they choose. The outcome of the combat-system in one game is pure survival, while in the other the goal is to gather experience points and trinkets. And while one game’s story is linear, the other is full of choices as of what to do and when to do it. However, Carr also mentions other aspects which directly conflicts the statement of Aarseth and Juul. Some being that the difference in music and camera angles makes a major difference in the consumer’s experience. Some participants in the genre debate (Clearwater, 2011, Simons, 2007) argues that some game scholars such as Juul and Aarseth has a tendency to choose early and highly abstract games – such as chess – to base their examples off of, in order to get their point across, ignoring the more cinematic and narrative aspects of modern games all together. The limitations of technology has indeed changed the debate of genre completely, and is an important factor to note, when we discuss this subject. Andrew Hutchison writes about how a designer will always have to work around technological shortcomings in order to execute his vision the best he can. And not only did the designers have to worry about the capabilities of their own machines on which they were designing, but also the capabilities of the computers owned by consumers. Hutchison even tells how many of the early massively successful games would push people to upgrade their home computers or buy entirely new ones, just for the sake of playing. This rapid development in technology is why we have seen a massive shift in play styles over time, from simplistic game genres like Arcade, to more graphic-focused choices such as 3D Shooters. Even if designers in the early days of game making had the vision of great graphics and cinematic effects, it simply wasn’t possible to push such a product to the casual consumer. The amount of games produced in each genre since 1975. 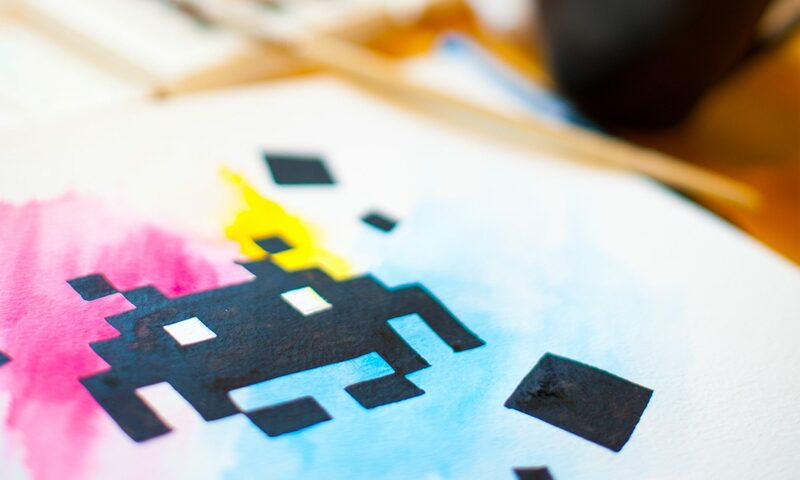 A game like Space Invaders is nowadays considered Arcade, but it is not far-fetched to think that if it had been made with todays technology, it would be an entirely different game, belonging to an entirely different genre. If we had handed our modern technology to the original developer, Nishikado, would he have stuck with the pixel graphics and the 2D format? Space Invaders(1978) and No Man’s Sky(2016), both with space ships and bullets. Finally, there is the issue of App Stores, marketing and video game journalism. As Clearwater (2011 p.37) points out: “Among prominent video game review websites and magazines, there is general uniformity when it comes to genre labels.” No matter what game theorists and scholars try to conclude about genre, reality is that over time an extensive lexicon has already occurred, simply by a large community agreeing on similarities and trends. Journalists and marketers are now happily basing their labels on this social construction, simply because it provides a familiar vocabulary consumers already know. So despite the style of gameplay being an ideal way of pinpointing a genre (adventure, roleplaying, shoot-em-up), there is no denying that taking labels from literature or film (horror, sci- fi, drama), is still a very valid way to describe the game content to a potential costumer. In the world of marketing, where an accurate or seductive description is much more important than theoretical correctness, these labels wouldn’t be judged or shunned for not fitting the ludologist bill. In conclusion, a genre is still a wildly discussed subject with no clear-cut definition. Ludologists would say one thing, narralologists another, and consumers and marketers a third. But in terms of video games, there is no denying that the style of gameplay plays an important role in communicating what the game is to potential consumers. Furthermore, the more cinematic and story heavy the game is, the more aspects from the movie and literature world starts to come into play, in order to describe the emotional experience. Over time, technology has shaped which genres were available to designers, and as time went by, new genres got defined by seeing new tendencies and innovative ideas. It is curious to think that video game genres themselves have been created by the early examples of the industry, and now the newer games are subject to them, by being forced into predetermined categories. Are current game developers limiting themselves, just to fit into a genre? And what will genres look like in the future with technology still constantly changing? Adams, Earnest & Rollings, Andrew (2007) “Fundamentals of Game Design” Person Education Inc. p. 81-83. Zimmerman, Eric & Salen, Katie (2006) The Game Design Reader, The MIT Press. Gygax, G & Arneson, D (1974) Dungeons and Dragons [game] Wizards of the Coast. Hello Games (2016) No Man’s Sky Hello Games. Konami (1999) Silent Hill Konami. Nishikado, T (1978) Space Invaders Taito. Next PostNext When are Animated Characters Uncanny?